Send your office efficiency into overdrive with these top workplace tech tools. It's no secret that the modern office is becoming increasingly populated with gadgets and tools aimed at improving connectivity, efficiency and productivity. But how can you spot the products that will give you that extra boost? We've rounded up some of these clever extras, from an ultra-secure USB drives, through a tiny docking station, to one of the weirdest gadgets ever to land on Techradar Pro, courtesy of a Kickstarter campaign. Another Indiegogo/Kickstarter campaign brings us a product range that will put a smile on owners of Apple MacBook and MacBook Pro laptops. 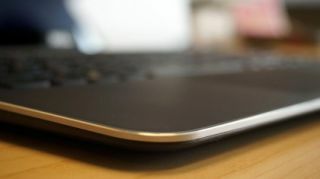 The DockCase adapter is essentially a docking station that expands the number of connectors that the aforementioned notebooks offer. Unlike previous attempts, the designers have opted for a enclosure that wraps around the Apple power supply unit and essentially augments its capacities: think of it as an exoskeleton for the USB-C power adapter. The 30W MacBook adaptor gets a HDMI connector (v2.0, so capable of handling 4K) and a USB 3.0 port, the 61W MacBook Pro 13-inch model gets an additional USB port while the 87W dock for its bigger sibling adds another two. We had access to one of the first finished units and we’re glad to report that, after a few hiccups, it worked as advertised. Check if the Apple power brick is well connected with the product; the light will be lit up once DockCase Adapter is connected to the MBP. Also use the cable in the box, rather than your original cable as the Apple cable for MBP can only transmit power, not data. We’d love if DockCase’s bundle cable could be a tad longer and would wish that Seesaw use a sturdier white plastic case for the dock design. One thing we can't really complain though is how affordable it is, at least during the early bird period. The MacBook HDMI model costs a mere $40, reaching $47 for the MBP 13 and $52 for the MBP 15 (costs are without shipping) with adding a pair costing $30, $35 and $44 respectively, great if you work at home and in an office. Is this the most secure flash drive ever? We don't often get Indiegogo projects on our list but we're making an exception for the EyeDisk, which hails itself as the first unhackable USB flash drive. The concept is pretty simple; use your iris as your password rather than cumbersome passwords. Research has shown that iris recognition is more secure than facial recognition and fingerprint encryption and as a working prototype, it works perfectly well even with the dark. It boasts a binocular registration method and a monocular/binocular verification one. It is compatible with Windows and Mac but not Linux and you will have to run an app every time you plug it in a client. There's no password to log though, just your iris to be scanned and this takes a few seconds to be registered. You just need to look at a mirror on the side. We'd prefer to have a sturdier model as this one is made of plastic and would probably not last long in a rugged environment. You will also need to carry a USB type-C at all time to activate the drive as it doesn't have an actual male connector. Other than AES256-bit encryption to keep your data secure, the EyeDisk flash drive consumes only 2W of power and weighs a mere 20g. It managed some very decent numbers on CrystalDiskMark (130MBps transfer rate on read and 84MBps on write) which means that it won't keep you long. At the time of writing, you can only pre-order it via Indiegogo, the crowdfunding platform, and it is scheduled for delivery from March 2019. With a starting price of $59 plus shipping for the 32GB version and $99 for the 128GB, it is reasonably priced although the prices are likely to go up once the early bird offer ends. We'd love to see something similar come to Windows laptops equipped with a Type-C connector although one has to say, competition is likely to be far more intense. Having a great display is becoming increasingly important in many home offices, especially as more of us move to a multi-screen environment. Dell's newest 32-inch 4K monitor, the Dell U3219Q. offers a bright and vibrant Ultra HD display that is perfect not just for video or gaming, but for workplace applications such as video-conferencing and data modelling. The unit is fairly bulky once unpacked, but when set up can be adjusted to fit a number of different space allowances, and thanks to an moveable height option, should mean it's not a strain on the eyes or neck. The U3219Q features an incredibly useful collection of connectivity options, sporting not just HDMI, USB and DP ports, but USB-C as well, meaning it'll easily slip alongside your existing laptop or PC. The unit even ships with a USB-C and HDMI cable, meaning set-up is quick and easy - just what you need to smarten up your office. The Mophie Powerstation USB-C XXL looks like no portable battery we've seen before. It uses a soft fabric finish and while it has some hard edges, it minimizes the risk of getting your items scratched by eliminating pointed corners altogether. At $149.95 though, it will be a tough sell with so many choices out there in the market. Its relatively low capacity (19,500mAh) will be a concern when competitors routinely offer 30,000mAh or more. That said, Mophie claims that the battery will be able to add up to 14 hours to the battery life of a USB-C Macbook which is no small feat especially as Mophie says that this would be additional video playback time rather than having the laptop just sitting idle. Apple states that the MacBook has a battery life of up to 10 hours so you'd be more than doubling that. The battery charger also supports Fast Charge and can send 30W of power to any compatible devices. At 390g for a thickness of merely 23mm, it is very portable. Add in a two year warranty and it looks like a decent deal. Bear in mind though that it has only two ports (one USB Type-C and one USB-A) and that the competition offers more features at less than half the price (albeit without the cachet). Jackery, for example, offers a 19,200mAh battery with a 45W output that can charge bigger laptops, ditto for the RavPower Turbo series which packs a larger 20100mAh battery. Both have three USB ports and come with a very significant discount compared to the Mophie (up to 67% off). Note that there is an even bigger (and even more expensive) Mophie 3XL battery that comes with an additional port and a third extra capacity. Premium security that comes at a (very) steep price. The D300S was announced by Kingston and is an updated version of the D300, launched in 2016, with the suffix S standing for Serialised; more on that later. The drive looks like a standard USB drive but sturdier and much, much more expensive. The smallest capacity - 4GB - retails for £100 while the largest one - a 128GB one - sells for a staggering £520. Now there is a reason why the D300S carries such a premium according to Kingston. The drive uses custom hardware for encryption (FIPS 140-2 Level 3 256-bit) and decryption which eliminates vulnerabilities associated with any process done on the host system. That chip and the rest of the hardware is sealed in a tamper evident epoxy material that hardened when it dried. The drive is also waterproof up to 120cm and should handle bumps and falls easily. The D300S also uses a digitally signed firmware which makes it impervious to the BadUSB attack and it will delete the encryption key after 10 invalid attempts, thwarting any brute force attacks. Two additional features that separates the S model from the standard model is a barcode and a unique serial number; together they allow system administrators to scan or read the code when configuring the drive. There's also a virtual keyboard that reduces the risk of having a keylogger storing the password. Sadly though, it does suffer from the fact that you need to install an application prior to using the drive on Windows and the write speeds claimed by Kingston are shockingly low at 40MBps. Read speeds are better at 250MBps. All in all, Kingston delivers a solid product but this is a very competitive market with the likes of Aegis, Secure Data or Datashur providing some interesting alternatives. Note that a Serialised Managed (SM) model will follow shortly if Kingston's website is to be believed. Enhanced encrypted data at a much lower price. If you need to have small amounts of sensitive data being carried around, then the 3NX could well be a life saver. It brings advanced data protection features to a mainstream market thanks to its attractive low price ($59 for the 2GB/4GB model) and $189 for the 128GB one. What you do get is some military grade, enterprise-level features like FIPS 140-2 level 3, real time hardware-based encryption, a platform-agnostic setup and a rugged extruded aluminum enclosure. The data is encrypted using an onboard 10-digit keypad and is powered by an onboard battery. The 3NX comes with a three-year warranty as well as an IP67 rating. Apricorn claims that the device can hit read/write speeds of up to 77MBps/72MBps, which is more than decent for a USB 3.1 device. As part of the package, the key can be configured to support independent admin and user PINs. Having the keypad on the key itself makes it near impossible to hack as the encryption hardware is sealed inside the USB drive, not on the host computer. Furthermore, the buttons are wear resistant and designed not to reveal the most used buttons. Just make sure you don't forget your PIN as you will only have as few as four attempts before the drive deletes the encryption key and with it the ability to decrypt the data stored. The thought of packing the equivalent of nearly 1,000 CD-ROMs on something barely bigger than the average human fingernail would have been unimaginable only a decade ago. Now storage companies like Samsung, Sandisk or Integral are slowly pushing 512GB microSD cards in the market, fuelled by demand from mobile devices. PNY is one of the latest to do so with the Elite, a card that has a rated reading speed of up to 90MBps and enough capacity to store over 80 hours of full HD video content, plus the bonus of having lifetime warranty. At $350, it is comparable in price with other products in the same category but far more expensive than the 400GB SanDisk Ultra which can be had for about a third of the price for three quarters of the capacity. Owning a 512GB card, the highest commercial capacity available, will allow you to dramatically increase available storage on your smartphone. 512GB is the maximum storage capacity available on phones likes the Samsung Galaxy Note9 and a 512GB card essentially doubles that amount; great for 4K footage of field visits or business videos. Other devices like Microsoft’s Surface Pro 6 tablet will also benefit if you want to extra (removable) storage capacity although the read/write speeds are likely to confine the card to a pure secondary storage role. Omnicharge's Omni Ultimate battery charger is not for everyone. It is big, it is bulky and expensive. Note that the Omni Ultimate has been approved as plane safe - so you can take it with you in the cabin when travelling. You just need a form to fill in for it pre-boarding, which you can get at the airport/gate. For a growing community of demanding power users though, this battery pack is likely to be an absolute godsend. So much so that an Indiegogo campaign started beginning of October 2018 is likely to raise nearly $1 million from more than 4000 backers, nearly 20x its original flexible goal. The external battery is built like a tank and is both dust and splash resistant with rubber flaps covering its power outputs. And its list of features is just as impressive: it has a power outlet that can delivery up to 150W DC or 120W AC output, a 40.3Ah/145Whr capacity, a USB Type-C connector that can deliver up 60W power, two USB ports supporting 15W (5V3A) each, a three-hour fast charging (QC3.0-compatible), pass-through charging and a useful OLED display that shows you battery capacity in real time (and to three decimal places). You can charge it using a solar panel and it is equipped with pass-through charging plus you can even add a spare battery pack. Note that there is a 230V EU version available (but no UK because of the plug size). With an SRP of $599 though, it will be a tough sell especially when there are cheaper (but less powerful) options around. The MaxOak K2 for example is cheaper and has a higher battery capacity but doesn't have AC output or USB Type-C connectivity. The RavPower AC Power Bank can output to AC but has a battery capacity of only 27Ah. The Omni Ultimate will be available via Amazon in Q1 2019 (planned for end of January/start of February) in the UK and in the USA. Other territories will follow. An all-in-one work hub that is a must-have for MacBook Pro users. Ensuring your device is powered up on the go is a daily worry for many of us, and there's nothing worse than running out of battery at a crucial time. Linedock thinks it has the answer with its slim and stylish power bank to keep your Macbook charged up when you need it the most. At just 9mm across, the device slips in neatly under your laptop and packs in a massive 20,000mAh rechargeable battery that should keep you powered up on the move. Linedock has nine ports in all, including three USB-C ports, three USB 3.0 ports equipped with Qualcomm QuickCharge 3, an SD card and a DisplayPort hub, and multiple devices can be connected at once. But that's not all - as Linedock can also act as a spare SSD for your device, with the option of adding 256GB or 1TB of storage as an extra bonus to make this a true mobile work hub. Lindeock has been designed for 13in MacBook Pro devices, but the company says that it is compatible with any laptop powered by USB-C, meaning PixelBook owners are in luck. At $299, this is simply a must-have for Mac users that work on the go, offering style, power and flexibility. With conference calls becoming an increasingly common part of modern business life, the need for reliable hardware to support this is greater than ever. The OfficeCore M2 is the latest release from Chinese firm EMeet, and looks to provide a smart and stylish way to make sure your calls go off without a hitch. The OfficeCore M2 offers 360-degree voice recognition thanks to a number of embedded microphones, supporting a range of up to 26 feet away, with the company adding that should support calls with up to 12 people without interference. The device can also link to mobile smart assistants to facilitate greater communication, with Siri, Cortana and Google Now all supported via Bluetooth, although our tests found that this was often patchy to set up. The major selling point of the OfficeCore M2 is its portability. Equipped with a 2500mAh battery that should easily last through even the longest conference calls, the device can quickly be picked up and carried around in a shoulder bag or rucksack. At $189, it's not the cheapest speakerphone on the market today, but if you're in the market for a device that can easily be taken on the go, this could be the one for you. Staying online when working on the go has become an incredibly important issue for all mobile workers, as an unreliable connection can be a disaster. Netgear is looking to solve these worries with its new Nighthawk M1 mobile router, which it says is the company's fastest yet. Capable of supporting Gigabit LTE speeds, the Nighthawk M1 uses four-band carrier aggregation and Qualcomm's Snapdragon X16 LTE modem to support mobile downloads of up to 1000MBps, as well as uploads of up to 150MBps. Our time with the device found the actual speeds to be fractionally lower, however streaming and uploading were both fast and reliable, both at home and out and about. The Nighthawk M1 is slim and lightweight, meaning it can be easily carried around in a rucksack or messenger bag. Netgear says that the battery life of the can last 24 hours, and our tests found it comfortably survived a full working day. Set-up is a quick plug-in process, with no external software needed, and the device can even use its USB connectors to charge your mobile device. In the UK, the Nighthawk M1 can be purchased from Amazon for £299, or via pay-monthly contract with BT or EE. Both options are fairly pricey, with EE offering the device for £29 a month for 24 months after a £99 upfront payment, but if you're looking for fast and reliable connections, this device is ideal. A stylish, noise-cancelling addition for when you need some quiet at your desk. Offices can often be noisy places to work, so if you are looking to cut yourself off from the world around you, Jabra's latest Bluetooth headset could be the answer. The Jabra Evolve 75e is the company's latest attempt to help boost the productivity of office workers everywhere with a comfortable headset that offers long battery life and stylish design. Jabra says that the Evolve 75e are the world’s first professional UC-certified wireless earbuds, making the device ideal for carrying out external or conference calls wherever you are without the need for tangled phone wires or complicated UC set-ups. Set-up is simple, as the headset connects to your smartphone, laptop or desktop via Bluetooth and a USB plug-in. There's no need to download any extra apps or services, meaning you can jump on calls right away. The sound quality was excellent, with the buds cancelling out the noise of an active workplace, and the in-built microphone able to deliver a clear input. The only issue we had with the Evolve 75e is that Bluetooth connectivity would occasionally drop for no apparent reason, but with the compact design and long battery life (Jabra promises up to 14 hours) provided, this seems like a minor hiccup. As more and more consumers ditch cash for contactless and digital payments, businesses of all sizes also need to adapt. Square has long been one of the most exciting payments companies around today, and has now finally brought its Reader product to the UK for the first time. The product acts as a mobile POS, allowing customers to quickly pay for their items using a contactless card, mobile or wearable device. Targeted predominatly at small businesses or traders, the Square Reader is slim and compact, easily fitting in the palm of your hand. The £39 reader weighs in at just 56g, meaning it can be handheld, or tethered to a till or counter using an additional £19 dock, allowing for a truly mobile steup. Anyone signing up to Square's service can get approval to start using the system within the hour, taking much of the headache out of setting up a new payments platform, with Square’s own software system offering a POS service as well as in-depth analytics. The tool seems like an invaluable asset to any small business looking to grow or expand, or any company looking for a more mobile setup. Perhaps our only gripe would be that the device is potentially too compact, and could be lost - but asides from that, a Square Reader could be the key to taking your business to the big time. Dealing with a number of connectivity options is now an increasing challenge not only for office workers, but also those whose working habits are a bit more flexible. If you're someone who is constantly connecting in different locations, for example hot-desking in multiple offices, then StarTech has you covered. This new mobile hub hooks up to your smartphone or laptop via USB-C, coming with connections ports for USB, HMDI, ethernet and USB-C, meaning you should never be caught short - and it's small and light enough to be carried in your pocket. The HMDI connection supports UHD 4K displays, with the USB-A supporting Fast-Charge technology, meaning you can power both the adaptor and your device in one go. A stylish and portable way to turn any room into a boardoom - but at a high price. Many of us know the pain of conference calls being ruined by poor connection or call quality, and with many businesses today choosing to embrace mobile working ideas and services, the need to stay flexible yet connected is paramount. Sennheiser is looking to solve these woes with its ultra-mobile TeamConnect Wireless - in essence a portable conference room, which can be packed up and carried around for workers on the go. Made up of four speakers, all carried around in a stylish case which doubles as a charging hub, the system can be connected to any laptop, smart device or VC system via Bluetooth, USB or 3.5mm jack. Set-up is quick and easy, allowing users to get up and running in a matter of minutes, with Sennheiser saying the kit can support up to 24 participants at once. Our tests showed the audio quality to be very effective, even with multiple participants on different lines, with no connectivity issues. The ultra-portable design of the TeamConnect Wireless is the major selling point here, as the stylish case is able to charge up the speakers to ensure you're never caught short, and takes up less space than a rucksack. However this stylish product doesn't come cheap, costing £3,940, meaning it may be out of the price range for some SMBs. For those that can splash out though, this is an eye-catching piece of kit that allows you to stay connected and conversant with your team or customers wherever you are.